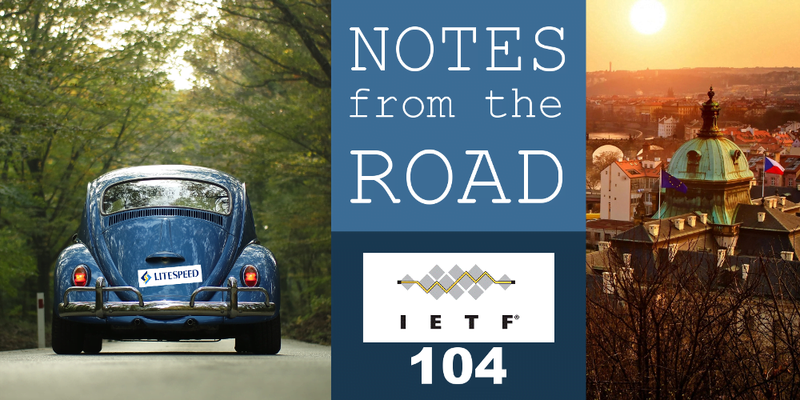 IETF 104 has come and gone. Held in Prague last week, the conference had plenty of interesting meetings. I wanted to follow the progress of the QUIC, TLS, HTTPbis, and DoH Working Groups. I attended the meetings remotely despite the inconvenient time difference. It takes two to tango. While there are many server implementations at various stages of development (for example, did you know that www.litespeedtech.com can be fetched using ID-18 version of the IETF QUIC? ), there are no browsers that use IETF QUIC protocol. David Schinazi (Google) reported that Chromium only supports the QUIC handshake for now, while Eric Kinnear (Apple) said that Safari has a functional IETF QUIC branch. As QUIC uses TLS 1.3, it must somehow support key updates. There have been several proposals how to do this. Martin Thomson (Mozilla) summarized them in his presentation to the Working Group (see slides). The august body, predictably, failed to reach consensus and thus compelled the chairs to empanel YADT (Yet Another Design Team) headed by David. Logging, Tooling and Debugging for Modern Network Protocols. Robin Marx (Hasselt University) has been researching how and what information to log in order to be able to generate informative pictorial representations of various connection events. Robin proposed to create a new, structured log format (tentatively named qlog), which, when used by both endpoints, will facilitate debugging or troubleshooting network issues. The collection of use cases he has compiled is impressive. The audience even proposed creating a dedicated qlog Working Group to log everything – and it just may happen. Stay tuned for updates. QUIC tracing. Victor Vasiliev (Google) has been working on logging and tracing network events since he was an intern at Google (while still an intern, he was the one who spotted a symptom of the Linux Cubic quiescence bug). Victor’s tooling focuses on connection performance and also relies on rich data logging. QUIC Logging: The In-Network View. Jari Arkko’s (Ericsson) presentation described spindump – a tool to observe and display characteristics of a QUIC connection using the QUIC spin bit. The spin bit is a controversial property of the QUIC short packet header and it was the subject of much contentious debate. (LiteSpeed position from the start was to support the inclusion of the spin bit into the QUIC protocol. We implemented spin bit support a few weeks ago and deployed it on our test endpoints as well as www.litespeedtech.com). Part of a slide from Robin’s presentation. The QUIC WG Interim meeting scheduled at the end of May in London may become the last our WG holds. As usual, the official IETF WG business will be preceded by two days of interop, which will target the (yet unpublished) 20th revision of the IETF QUIC Draft.